If there are stats you'd like to see (say your base Penetration chance), please contact me if you know the rating->percent conversion. I will try to hunt down more but I don't have the time for that very often (lots of addons, lots of work). * Adjusts Window Scaling to always be medium sized no matter how zoomed in or out you are. Standard size = better size! More stats that were removed, better calculations. Plus *your* features! Leave a comment, say what you want! 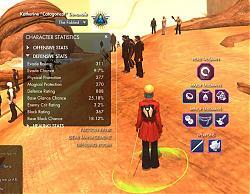 Unzip the addon into your The Secret World\Data\Gui\Customized\Flash directory. Say YES to overwrite. If you are already logged in, type /reloadui. If not, log in ya goof! Delete CharacterSheet.swf from The Secret World\Data\Gui\Customized\Flash. Say YES to overwrite. * Stats update automatically based on equipment, buff, etc. * Optimizations to camera detection. * Added static zoom level independent of camera distance. ** Basically the window is the same size no matter what, so you can use it while zoomed out! just logged in after patch and i cant see my gear in the character screen i can see it if i compare it to other gear but it appears that im not wearing any gear on my character. Any ideas how to fix this? Just disable this mod by deleting CharacterSheet.swf under The Secret World\Data\Gui\Customized\Flash. How did you not see the big red text on first page? Is there a way you can make the Character screen size toggable? Reason I ask is that now the Character screen takes up pretty much Half my screen @ 1440x900 resolution. I actually like the smaller character screen. Coming in a revision soon, yes. Could we get a field with the average QL score of equipped gear? Sorry I'll put in more info when I post the update today. Going to be going back to normal font, fixing the updates when you gain passives etc. Didn't mean to leave out the summary! Any reason why Glance Chance shows up in Defensive/Healing but not Offensive? Glance Chance is meant to be defense only. I'll fix this for today's update. Last edited by Catagorical : 07-16-2012 at 01:55 PM. And how does this variates from vanilla? There are a couple stats added to it, ie. Block Chance.